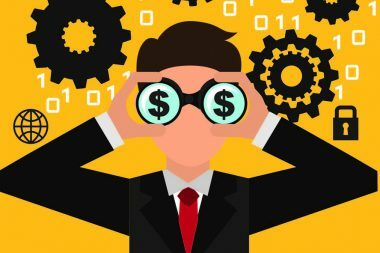 XRPredict – Profit from Prediction! The Bull Run is coming, but how soon? Put your expertise to the test or just have some fun. Predict the next target successfully to win everyones XRP contributions. An entirely new and transparent concept, XRPredict allows you to choose a date and time window when you think the value of XRP will reach the next target. To prevent an unbiased result, you may not predict a time within the next 24 hour period. Predictions as to when the event will occur will be accepted right up until the time that it actually happens. This is not a lottery; use your skill! 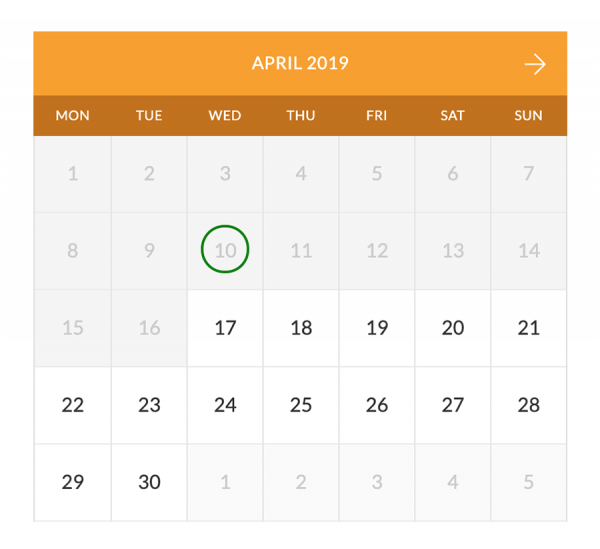 As there may be multiple entrants predicting the same date you must additionally choose a time window during that day. If the event occurs within your predicted time window, then you will win the wallet contents. My time window has elapsed? If your predicted date and time window elapses, you could still win the wallet contents. Should no accurate prediction of the time be made, the entry with the closest verified prediction to that event occurrence shall win. Enter your first and last name along with your email address. We require this information as a minimum in order to create your account here on XRPredict.com. Why do you not need my address? We are only interested in your prediction and your email address. Your entry will be validated through a transparent transaction on the XRP ledger. 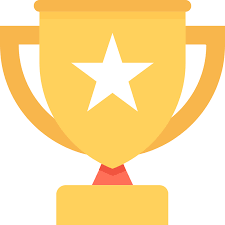 When you submit your contribution to validate your prediction we will be able to return your winnings should you predict the event occurrence correctly. You will be directed to the confirmation page to check your order, you can either finalise your order or return to the calendar to predict additional dates and time windows. Initially there will be a limit of 10 predictions per member. If you are already a member of XRPredict, welcome back; simply sign in to continue. Once you have reviewed your prediction and accepted the contribution amount proceed to the checkout to submit. All that remains is for you to send your XRP contribution to the XRPredict wallet. The contribution amount will be converted to XRP at the rate on Binance during checkout. Last 5 contributions received to the XRPredict wallet for the Current Target! Use the calendar to predict the date when you believe the value of XRP will exceed the current target. Your prediction shall be such that on the date you choose; the XRP in USD value will exceed the current target on Binance.com. This is not a lottery, raffle or sweepstake; use your skill! Should no accurate prediction of the date be made, the member with the closest verified prediction to that event occurrence shall win. To prevent an unbiased result, you may not predict a time within the next 24 hour period. Predictions as to when the event will occur will be accepted right up until the time that it actually happens. As there may be multiple entrants predicting the same date you must additionally choose a time window during that day. If the event occurs within your predicted time window, then you will win the wallet contents. Should no accurate prediction of the time be made, the entry with the closest verified prediction to that event occurrence shall win. What happens after my window passes? 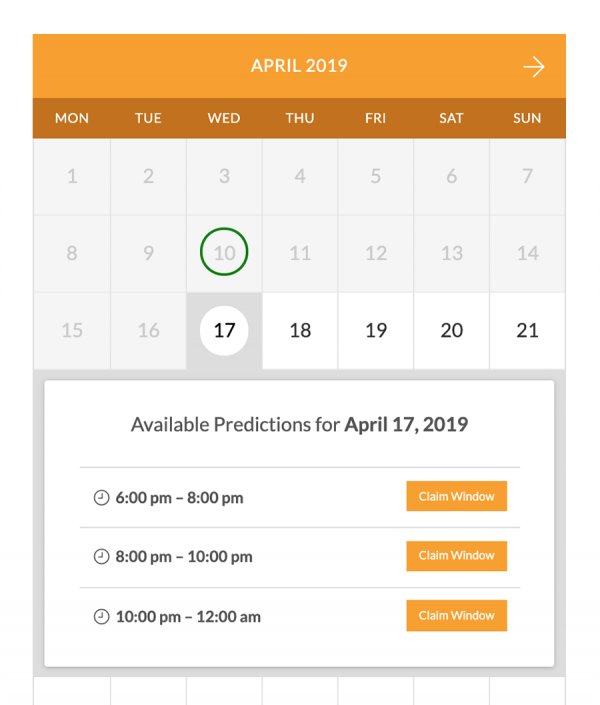 If your predicted date and time window elapses, you could still win the wallet contents; if you made the closest individual prediction to the event. Predict correctly to empty the wallet! If you have chosen the date and time window closest to the current target being exceeded in the XRP in USD value on Binance; you will receive ALL of the contributions sent by entrants predicting that target event. 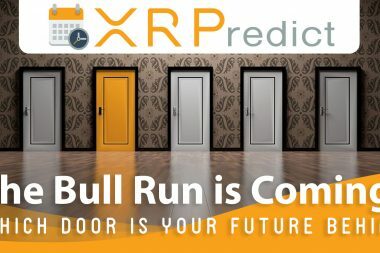 XRPredict.com will decide the result by confirming the prediction order status, the date predicted, the time window during the day chosen and verification of the contribution transaction in the XRP ledger to the XRPredict cold wallet. Their decision will be verifiable and will be final. Payout will occur automatically and will be sent to the XRP wallet address originally used to send the winning entry contribution. Have a look how XRP has been performing against popular FIAT currencies. hopefully we can answer some of them here! Why do I have to contribute to the pot? Do I really win 100% of all contributions? Can I send from XRPTIPBOT? Can I change my XRP wallet address? Can I withdraw or change my prediction? What if no-one predicts the event exactly? What are the limits to predicting? Who chooses the targets and exchange? The whole concept of ‘Profit from Prediction’ allows us to create a cold wallet that grows in value to award the winner predicting the date and time window an event will occur. This is a competition and is not gambling. Prediction is based on knowledge and skill not on probability. The contribution although listed as $2.00 will be converted to XRP and added in realtime to the XRPredict wallet. As the quantity of predictions rise so does the balance in the wallet. As the value of XRP rises, so does the value of the balance. We operate as a non-profit organisation therefore the value of return offered to the member making the closest prediction comes directly from the contribution of all entrants. Do I really win 100% of contributions? Yes 100% of all entrant contributions is returned to your XRP wallet by settlement once the entry is verified and the event has been confirmed as having occurred. 20XRP however; must remain within the XRPredict wallet to commence the next phase with a new target value. The wallet address and private keys remain our property and responsibility. 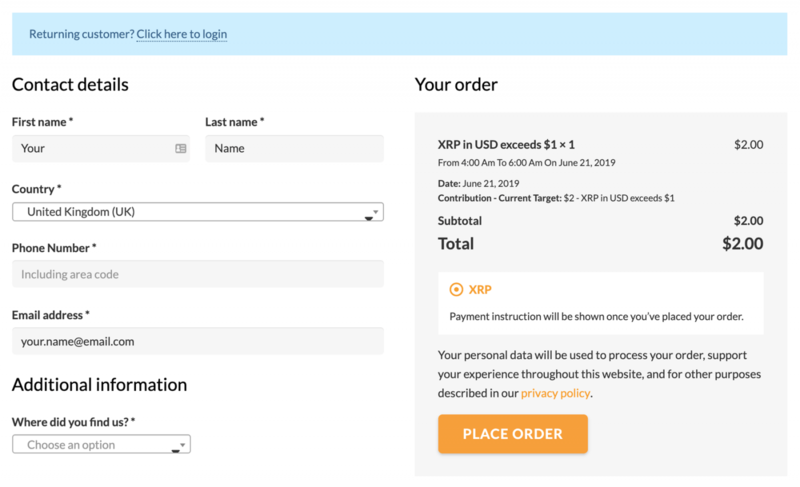 We publish the live XRP in USD value on the website below the current target. This includes a graphical representation of the proximity of the current target to XRP value. You are free to monitor the value of XRP in USD directly on Binance.com. The time of the event occurrence shall be verified with Binance immediately after the event and proof of the time that the XRP in USD value passes the target shall be sought. The member predicting the time window containing the event occurrence shall be awarded all contributions held within the XRPredict wallet. Your prediction will only become live once your contribution has been received on the XRP ledger and verified by our system. Your transaction and the wallet address you sent the funds from will be recorded against your approved prediction. Should you be smart enough to predict the time of the event correctly we will transfer the entire contents of the XRPredict wallet back to your personal wallet address. This transaction, just like all contributions will be transparent and detailed on the website for all to view. 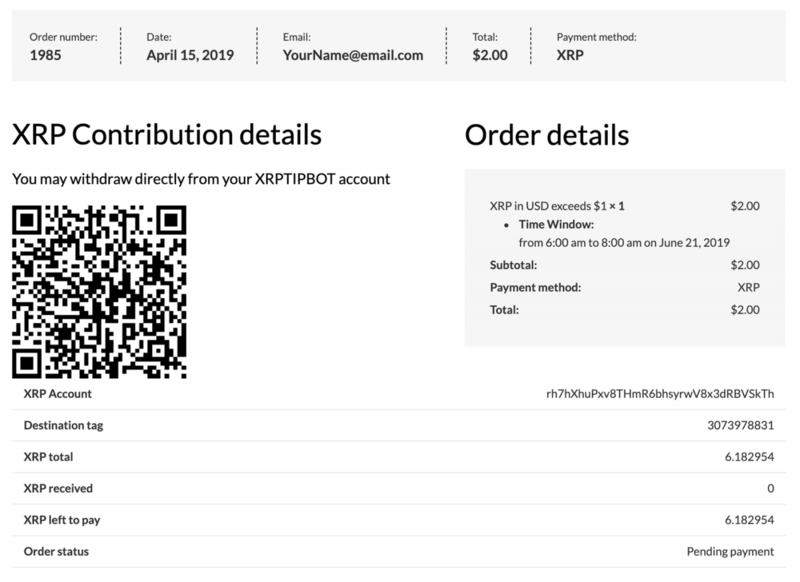 We are more than happy for you to send your XRP Contributions from your XRPTIPBOT account. To do this; please visit your XRPTIPBOT account and select withdraw, enter the desitnation address and tag above and hey presto! Don’t worry, your transaction is fully detailed on the XRP Ledger and will appear on our main page. Your XRPTIPBOT source tag is clearly identified, if you win; we will return the XRP to your XRPTIPBOT balance. We only allow settlement of the winning funds to be sent back to the originating address. Our system does not take any information as to who you are other than a name and email address. We do not verify your identity in any way other than email confirmation. Therefore we cannot change your wallet address hash within our system as we have no way to verify you are the person that made the prediction in the first place. Our only confirmation that you made the prediction is through your original XRPL transaction. If the wallet is no longer available we will roll 50% of all contributions over to the next target amount session and send 50% to a charity nominated through a poll on our website by our members. Once a prediction date and time window has been selected you do not have to continue with the prediction. Even if you make the prediction and confirm your choice your entry is still unconfirmed. 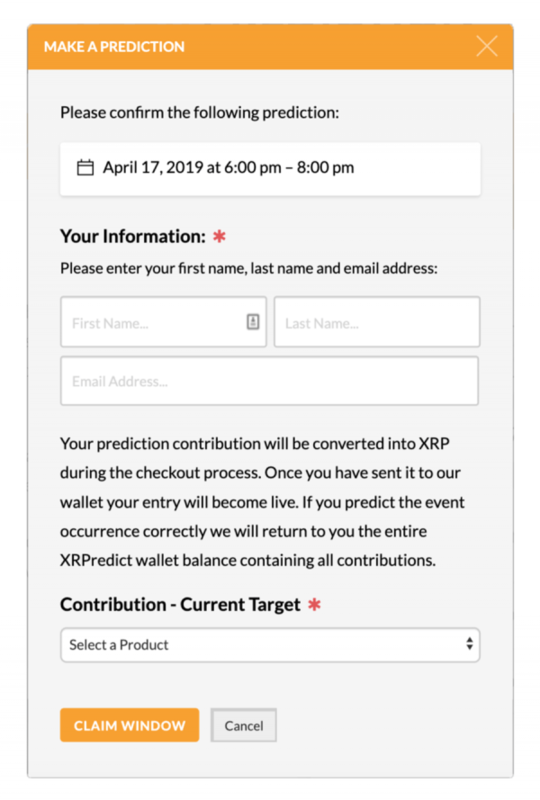 In order to validate your prediction you must send the XRP contribution to the XRPredict wallet as detailed on the order page. Only when the system detects through the XRPL that the transaction has been made will your prediction be validated and accepted. Failure to send your contribution within 60 minutes will render your prediction void and the time window will be returned to the calendar for others to choose. All predictions once validated are not able to be changed or cancelled. All contributions to the XRPredict wallet are non refundable. They are earmarked to be sent to the member that predicts the date and time window of the current target event occurrence. We hope to eventually get a full prediction calendar, however; this may be difficult as the concept is a new one and requires some time to mature. With this in mind, and to fool-proof further prediction sessions and targets, the member predicting the closest time window to the target event occurrence shall be deemed as the winning entry. XRPredict will use the accurate time obtained from Binance in order to validate the event occurrence, comparing that time to the time windows predicted. We will contact the member making the closest and second closest prediction to inform them of the result prior to making the transaction from the XRPredict wallet to the originating source. The current target is listed on our main page at all times. The target is reiterated throughout the website in various articles and sections. As a safeguard, you must select the target event you are predicting for along with the contribution value to be sent in XRP. Should there be a discrepancy within the XRPredict.com website or your emails, the value of the current target confirmed in your order email at the time of prediction shall apply. Once selected a prediction will be held for 60 minutes in order for you to send your XRP contribution and activate your choice. Should that time elapse the order will be cancelled and your time window returned to the calendar for others to choose. We must ensure that everyone has the best chance possible to predict the event occurring, in order to stop a member swooping in and collecting the wallet contents we have imposed a 7 day restriction; you may not predict a date or time window within the next 7 days. The system will automatically remove invalid prediction windows as time passes. We have tried to make the process as straightforward and seamless as possible however; please let us know if you encounter any difficulties. We do. Our current target is based on the rate of change noted over the previous few months and is set according to the growth and prospective growth of the market. We operate this idea on good faith backed by an established company and guarantee. All communication, information and transactions are totally transparent. We are functioning without profit as a method to further endorse XRP and aid in the adoption of the Digital Asset. By utilising the XRPL we can ensure that all transactions are uniquely authenticated in an irrefutable, immutable, and secure manner. There is no intermediary, we have a direct relationship with our members and are help accountable for all processes therein. XRPredict is a non-profit trading name of FRIXION Limited. A Company Limited by Guarantee and Registered in England No: 10259277. The company is regulated by the Companies Act 2006. Currently FRIXION Limited is not trading for profit in any way and has no overheads. All blog posts have a comments section, feel free to ask any questions you have about that specific post there. Anyone can send a message through the contact form below or members can raise support tickets from within their dashboard, we endeavour to respond within 24hours. 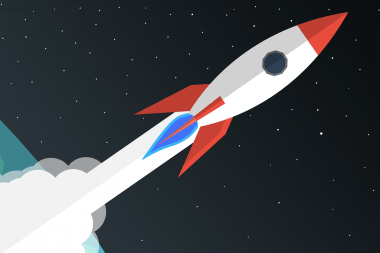 XRP to the moon baby, not going to miss the ride on this one, I think $5 is a fair contribution, I guess its just like a crypto lottery – but with skill! Offered up my opinion as a seasoned web designer, flows well, very good concept, hope it takes off just like my XRP investment! What a fantastic idea. Can’t wait to see what the target will be and get my predictions in! Looking forward to a windfall! Good Luck Everyone! Now you can Predict 4 Fun! How full are your bags? XRPredict is a non-profit trading name of FRIXION Limited. A Company Limited by Guarantee and Registered in England No: 10259277. The company is regulated by the Companies Act 2006.